Nikon D750 Review. When the D750 was announced, there were quite a few initial groans from the Nikon faithful, including me. The groans basically came because... Article on dslrbodies.com. 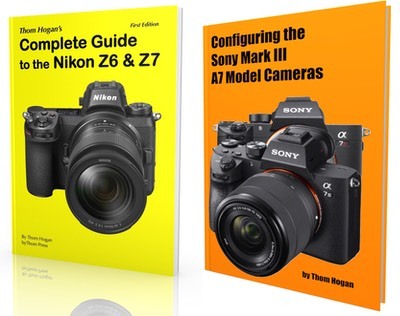 Nikon Firmware and Download Updates. The D750 and D810 get firmware updates; Nikon centralizes downloads. Article on dslrbodies.com. Canon Issues Gray Market Warning. Late last week CanonUSA apparently issued a one page statement about gray market products. Article on dslrbodies.com. B&H’s Most Wished For List. If we’re to believe B&H’s “most wished for gear” list (derived from people’s saved Wish Lists in their B&H account), we have the following interesting set of photographic gear to consider… Article on dslrbodies.com. And the Final Category: Waiters. Finally, the last cog in the camera growth problem for Nikon: those people that are just waiting for something. Article on dslrbodies.com. The Economics Problem. Mirrorless continues to be relatively flat in shipments this year over the past two years. Article on sansmirror.com. Leica M Sees Spots. I’d heard of a problem with an early M9 a while back, but recently there have been several fora across the Internet where users were reporting that they were seeing abnormal areas in their images when taken at small apertures. Article on sansmirror.com. Ultimately, Only You Are the Judge. "I really enjoyed the camera until I started going into forums and found some folks there seemed to downgrade it for one reason or another.” Article on dslrbodies.com. FastRawViewer Updated. My friend Iliah Borg and his team have updated their long-in-development FastRawViewer program (introductory price of US$14.99 until January 31st, 2015). Article on dslrbodies.com. The Secret Life of Capture NX2. A long time ago, or at least what seems like it, Miguel Banon created a utility called DNG2NEF. Article on dslrbodies.com. The Nikon DSLR pricing chart has been updated. Sony A6000 Review. It’s been some time since I’ve reviewed one of the Sony APS mirrorless cameras, and the A6000 represents a fairly major set of changes for that line from where they started, so I recently spent some time in Southern Utah shooting with this camera to see where Sony has gotten to. Article on sansmirror.com. More Doom and Gloom. Sony’s financial presentation last week in Japan caught a lot of attention, but I was a little surprised that no one really commented much on this slide. Article on dslrbodies.com. Gray Market Rises Again. When [gray market deals] pop up into near viral form like this, I get a lot of emails. They basically all ask “should I buy gray market?”. Article on dslrbodies.com.